JTB Align Plus Version 3.4 is released and comes with a couple of bug fixes. JTB Align Plus is a great help when you want to align text or blocks to a line or curve in AutoCAD. See also the post JTB Align Plus 3.3 for AutoCAD released. A free trial is also available on Autodesk Exchange Apps. Have you ever been frustrated over the many steps you need to take to navigate to the same folder as where your current drawing is, in AutoCAD’s file selection dialog boxes? No need anymore. When JTB Current Folder is installed, every time you open a drawing, or attach external references, insert drawing as block or create a block, you will have a Current Folder item on the left of your file selection dialog box (in the custom places area). The Current Folder will bring your active drawing's path just 1 click away, which otherwise is often several clicks away. Version 1.1 has a bug fix to solve problem with multiplying folders. 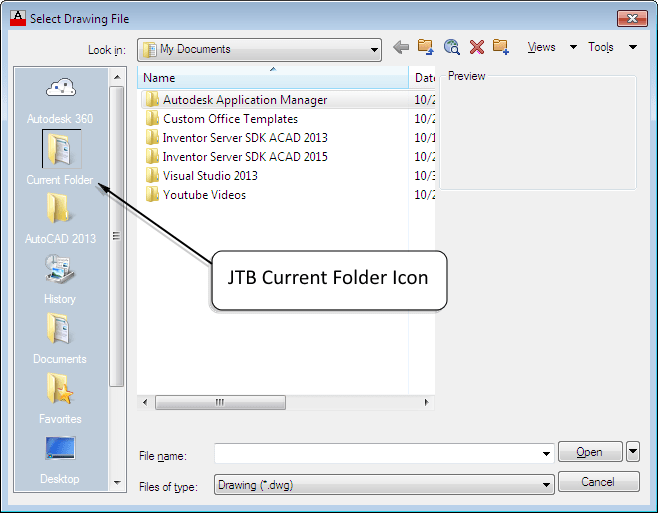 Give JTB Current Folder a try. It’s free and fully functional for a limited time. JTB Text Bubble Plus 1.6 for has been AutoCAD released. If you work with different kind of text bubbles that has numbers or letters that you want to automatically increment, JTB Text Bubble Plus can be a great productivity help. The basic Text Bubble app has also be updated with these news. You can read more about JTB Text Bubble Plus or purchase it from our product page.